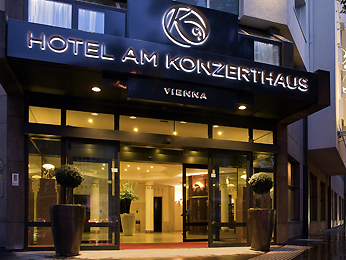 Strikingly passionate and remarkably innovative – our attention to every detailmakes the difference!Centrally located, in the historical heart of the city, the Hotel am Konzerthaus MGallery by Sofitel is the first port of call in Vienna for many guests and clients. The Hotel combines elegant interior with design-elements of the surrounding concert halls and theaters and thus creates a unique ambiance and a memorable stay in Vienna.Whether you plan a meeting, seminar, workshop or simply a private event – Due to our experience, our excellent service and our warm hospitality your guests will be hosted at an extraordinary level at every point of time.Our dedicated kitchen team with its creative head Stefan Speiser – again selected by Rolling Pin as one of the “50 Best Chefs” in Austria – is pleased to pamper you with culinary delights and make your break to something special.Our excellent quality of service, hospitality and your satisfaction isour primary concern. Our event facilities shine in appealing design, are flooded with light and feature up-to-date meeting technology. They are elegantly decorated and can be easily changed into one large room. With seating in theatre style the room offers space for up to 80 persons – The perfect location for seminars and conferences!Air-condition and complimentary Wifi can be taken for granted just as personal support before and during your event.The two boardrooms „Harmony“ and „Rhapsody“ are located on the first floor and are optimally suited for meetings, briefings or presentations up to 10 persons.The team of the Hotel am Konzerthaus offers professional experience and will gladly help you to adjust the offer to suit your personal requirements.